The full version of Crack can be found on 猫叉Master+ first album, Backdrops. Crack was available on GuitarFreaksXG & DrumManiaXG to players who have played the X-Trial Perfect Trial. The song was unlocked on August 23rd, 2010 for players earning an SS or S Grade, then one day later for each class below S Grade through September 6th, 2010 for players earning an N Grade. 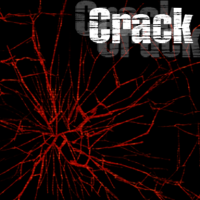 As of October 4th, 2010, Crack is automatically available in Standard Mode. Crack is unlockable in GuitarFreaks V8 & DrumMania V8 as of May 27th, 2011 by earning 26,000 GDP. Crack's overlays were removed in GuitarFreaksXG2 & DrumManiaXG2 Groove to Live. This page was last edited on 14 January 2019, at 03:11.